BENGALURU --- The first green helicopter earmarked for Indian Coast Guard has completed its build with installation of basic systems and had a successful maiden ground run here today. It was handed over to the Rotary Wing R&D Centre, a design house of HAL for integration and certification of 19 new systems. Director General Rajendra Singh, Indian Coast Guard, received the contract documents from Mr. T. Suvarna Raju, CMD-HAL during the event held to mark the occasion. Speaking on the occasion, Mr. Raju said for the first time, HAL has entered into a contract with ICG that includes Performance Based Logistics (PBL) support after the delivery of Helicopters for five years. 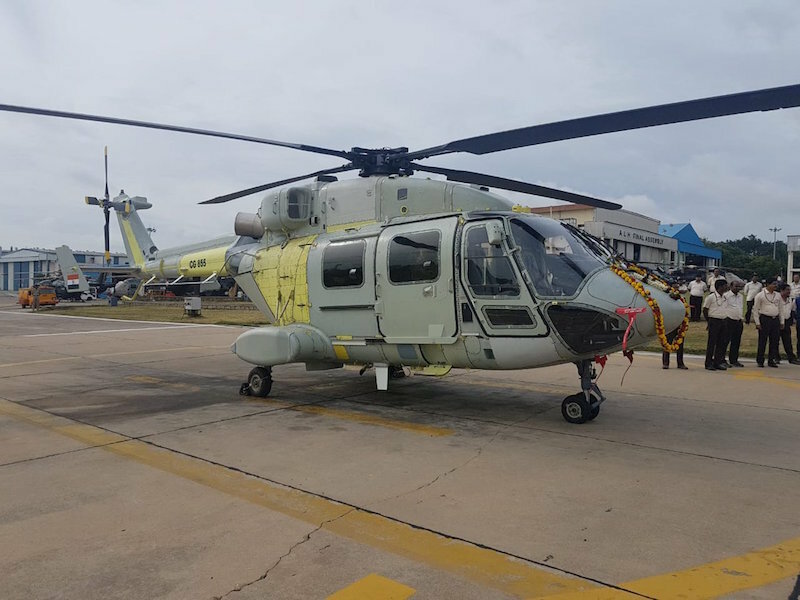 Already, HAL’s ALH Dhruv Helicopters have been extensively deployed by ICG for various roles such as Search and Rescue (SAR), casualty evacuation, armed patrol, coastal surveillance, VIP movement and the night SAR, he added. Mr. Raju said that the order reflects the trust on HAL’s capabilities and gives an impetus to Make-in-India campaign. It reposes faith of the Indian Defence Forces in indigenous ALH which has been serving them with distinction for a long time. The certified helicopter deliveries are scheduled to commence from 2020 onwards. HAL had signed a contract worth around Rs. 5126 crore for supply of 16 ALHs (Fixed Wheel) to Indian Coast Guard(ICG) in five year timeframe in March 2017 to boost the Low Intensity Maritime Operations (LIMO) and Coast Security capabilities. The first ALH Dhruv squadron of Indian Coast Guard was commissioned in March 2002 with its operational base at Indian Coast Guard Air Enclave (ICGAE), Goa. The PBL is the purchase of logistics support as an integrated, affordable, performance package, designed to optimize system readiness and meet performance goals for the product through long-term support arrangements with clear lines of authority and responsibility. The PBL is emerging as preferred acquisition strategy for the defence acquisition and asset management, as it ensures the product uptime availability to the customer while the responsibility gets transferred to the supplier.